Towards the end of my time living in LA, I began to feel remorseful for all of the wonderful things in the area I hadn't yet taken the time to see. 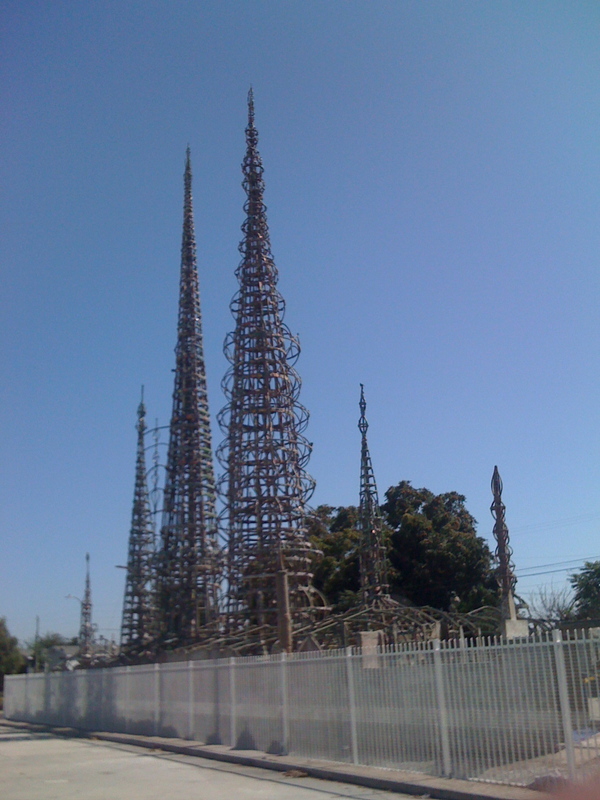 One of those was Watts Towers, a defining monument of local significance in South Central LA. My friends Luke and Chris accompanied me as we biked from El Segundo into the heart of South Central. We cycled somewhat apprehensively as South Central has a rough reputation and us being on expensive bikes in a place we'd never been before. Before long we realized we were in the vicinity of the towers but lost. Suddenly, three thuggishly dressed guys approach the three of us on our bikes. Thuggish1: Hey y'all lost or something? Me: Yeah, we're trying to get to Watts Towers, it's close to here right? Continuing to ignore the cop, the 6 of us part ways. I left out how my friend Luke has a "space bike" and resembles something of a Terry Gilliam character when riding; we got lots of funny looks in the residential areas. In any case, my return to Watts Towers was even less eventful. This time I noted the general good condition of the side streets and was only gawked at when I rode by a school: "Hey are you a superhero or spaceman/take me to marvin the martian yo!" I rode back on Manchester by the LA Forum, a staple of Inglewood and LA, 30 miles round trip.